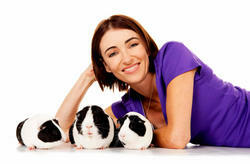 To celebrate the Disney DVD and Blu-ray release of G-Force, 27 January 2010, we asked Katrina Warren for her top tips and facts on Guinea Pigs. * Guinea Pigs have a variety of coat types. The most common is the Smooth-haired which has a short coat. There are also Long-haired varieties which require daily grooming and Coarse-coats which have swirly hair and a cute rough appearance. * Yes, but only to those prepared to commit to giving them proper care. They have a life span of five to seven years which requires a long term commitment. Be a part of all the G-FORCE action when you bring it home on Disney DVD and the 2-Disc Blu-ray Hi-Def Combo Pack from 27 January 2010!